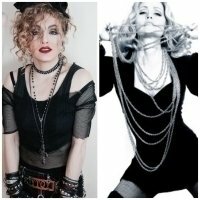 Madonna Celebrity Lookalike, Look Alike Impersonator Tribute Artist. The Best Madonna Celebrity Lookalike Impersonator in the World. All live vocals. Custom made costumes that are exact duplicates to the one’s that Madonna has worn in her sold out stage shows across the world. Madonna Lookalike Impersonator Tribute Artist. Have Madonna Look Alike at your next event. GREAT costumes live vocals Besser Entertainment 954-484-7884. ANY MADONNA SONG MAY BE REQUESTED!